The truth is: I had BIG problems making it ready for give-away. It's been a while since I made these frames and then they were meant for my own private use so I didn't - as I always do for freebies - make notes about used material. So I have been using days now trying to back track the used material, but without much luck. The included "Credits" are very limited but maybe one of you can help me recognise some of it and let me know? 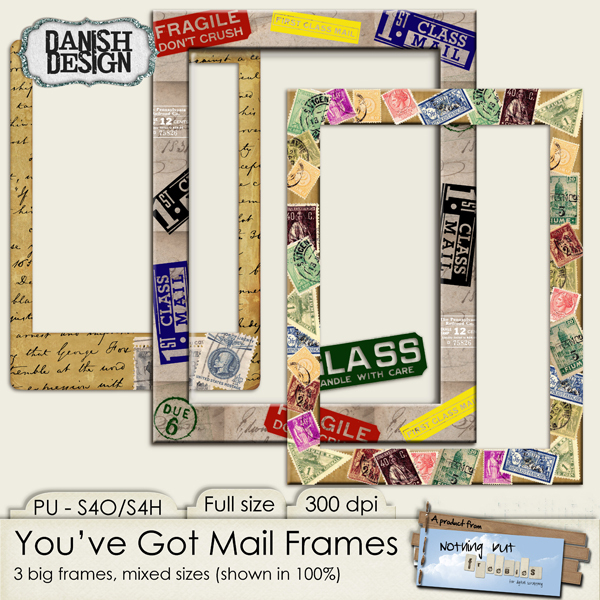 Here they are - last weekend's freebies - "You've Got Mail Frames". I'm done making specific promises, but I will promise to be back soon. thanks for the awesome frames! there never is any rush! just when you feel up to it! These are so beautiful....just what I needed for a card I am creating for My Daughter who is travelling overseas ...was wondering what travelling frame to use ...YAY for You ! with as much time as You need ! tee ! hee ! Thank you for the great frames! Checked my stash since the patterns look so familiar but did not find them after many searches. Will keep looking.